The military service of millions of Americans is reflected in Veterans’ Reflections: History Preserved, which puts you in the middle of the action of our nation’s wars. Through firsthand accounts of veterans who served during World War II, the Cold War, Korean War, Cuban Missile Crisis, Vietnam War, Korean DMZ Conflict also known as the Quiet War, and Operations Desert Storm and Enduring Freedom (Afghanistan); you’ll find yourself paying tribute to each and every veteran. The stories of personal sacrifice, commitment, and valor demonstrate the values that have made the United States of America the envy of the world. Sixty veterans recall their time in uniform, sharing stories that are tragic, heart wrenching, and sometimes funny. These stories provide an excellent opportunity to gain an understanding and appreciation of veterans. 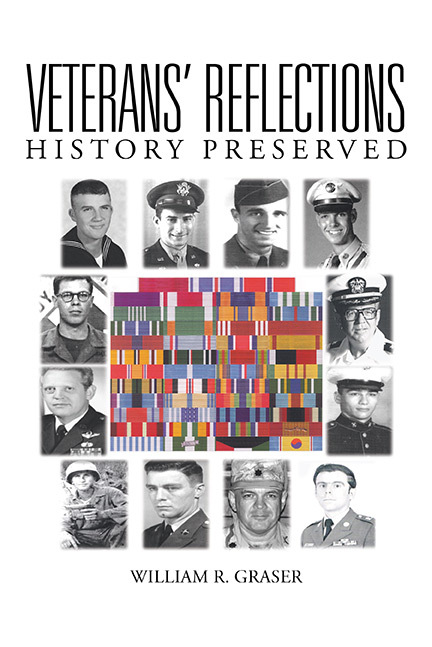 Celebrate what is means to be an American devoted to freedom with Veterans’ Reflections. As a veteran himself, author William R. Graser is close to this work, and it shows not only in his passion for his subject, but also in his attention to detail. His method weaves the veterans’ own stories into a historical overview of a specific conflict. The soldiers’ accounts go well beyond the war’s scorecard and reveal some of the actual fears and experiences of the participants.